This film received high praise on its release. I included it in my top five new releases when it arrived in the UK. Pawel Pawlikowski directed the film from a script by himself and Rebecca Lenkiezewski. Pawlikowski has worked in the UK for a number of years and this is his first film set in Poland where he was born and spent his early years. Praise has also been heaped on the design, cinematography, editing and music. The film was shot on digital and then processed to create a black and white image in Academy ratio. The film has a distinctive look with the grainy surface found on celluloid whilst the predominately static camera and minimal non-diegetic music create an atmosphere of silent contemplation. The film opens on Ida (Agata Trzebuchowska), a young novice in a Convent about to take her vows – poverty, chastity and obedience. She was bought there as a child and is now 18. The Superior sends her out into the world to visit her only surviving relative, Wanda Gruz (Agata Kulesza) who lives in Lodz. Ida’s visit leads to her discovering that her parents were Jewish and died during WWII. Wanda drinks and has occasional affairs despite being a judge. These two seemingly ill-matched women embark on a journey to find out more about Ida’s parents and their fate. Along the way they seek out people where the parents (Lebensteins) lived and also meet with a young jazz musician, Lis (David Ogrodnik). Wanda’s life changes drastically following the odyssey, what Ida’s future will be is ambiguous. S&S notes the film is set in 1961, presumably from information in the Press Pack. The film is opaque on both dates and to a degree places. But we are in the so-called Polish Socialist society of the early 1960s. The Regime has hardened into a fairly repressive society whilst the economy seems to have little developed since the end of the war. One character invites the protagonist to join him on a visit to Gdansk, clearly a reference to the future and Solidarity. The class viewed the film and then discussed it. What follows is my record of the many comments and the incomplete consensus on the film, though all enjoyed and/or were impressed by it. Students commented on the film’s feel of grim scarcity, both material and emotional. There are a few moments of liveliness or even joy: the dance at the hotel where the women stay: moments Ida’s spends with her fellow novices: and, though less certain, a jazz club. Whilst Wanda offers frequent extrovert behaviour Ida is mainly placid. There are a few moments of emotion: a silent laugh in the Convent refectory, but unexplained; a tear as a fellow novice takes her vows; and another as she bids farewell to Wanda. Everyone was impressed by the style of the film. Much of the feeling generated and our sense of the characters is communicated visually. The film features a number of shots with characters set against windows. Then, at the climax we see a character by an open window. And the film also works through the music. Suitable for Ida is a Bach theme whilst Wanda enjoys a Mozart symphony. And Lis plays a piece by John Coltrane. It seemed clear that Ida is an outsider in this Polish society. This enables her to offer a rather detached viewpoint. Intriguingly nearly everyone she meets behaves slightly differently with her, as she wears her nun’s habit for most of the film. The Catholic religion is a key component in Polish culture; even to this day, so religion also offers a separate set of values in the film. And this is enhanced by the presence of Jewish characters and our awareness of the persecution during war years: a persecution in which many Poles were complicit. There was some discussion of the camera work in particular. The film adheres for most of its length to static camera shots. Even when there are tracks, six or seven, these also use a fixed camera on a car, tram or dolly. However, and this suggests the ambiguity at the end of the film, our last sight of Ida, again wearing her nun’s habit, is in a reverse hand-held [or simulated on a Steadicam] camera. There are also several notable and impressive shots. One is an acute low angle, through a balustrade, as Ida reaches an agreement with a man who knew her parents. Another is a high angle shot of the hotel stairwell as Ida ventures down to the dance below. And there is a stunningly ambiguous shot as Ida wraps herself in a lace curtain after a particular tragic sequence. One aspect of the film is how it revisits the style and approach of the Polish and Eastern European cinemas of the 1960s: often subversive views of their societies. One intriguing suggestion was that the film could be seen as a road movie. 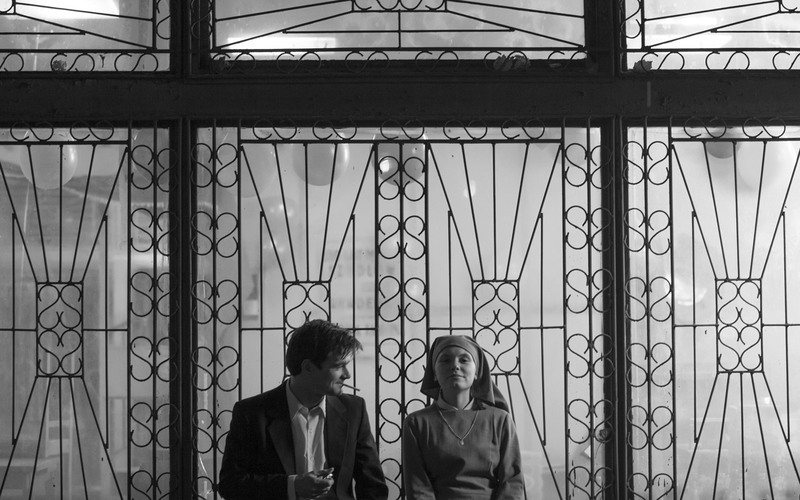 Certainly the film offers an odyssey for Ida, who meets a range of characters to whom she responds in different ways. And the end the film poses the question – has she arrived or does the road continue. Production Design by Katarzyna Sobanska and Marcel Slawinski. Cinematography by Lukasz Zal and Ricard Lenczewski. Editing by Jaroslaw Karminski. Music by Kristina Selin and Eidnes Anderson. Running time 80 minutes with English subtitles. Basia and Oscar leads their 'fans'. This film has ‘been described as a Polish Green Street (2004). The latter is part of the cycle of films that deal with British football hooliganism, though its distinctive feature is the recruitment of the US Elijah Wood into a British gang. In fact the suggestion is somewhat of a misnomer. Whilst Flying Pigs features football and football supporters that is only a plot mechanism [though not quite a MacGuffin]. The film is really about the relationship between two brothers and, as a colleague suggested, is closer to a family melodrama. Judging by the film the Polish fans and hooligans are not as bright as their British counterparts, but they are friendlier. As far as it is possible, the violence is good-natured. 30-year-old Oscar (Pawel Malaszynski) introduces us to the setting, where he is a supporter of the local team, Czarni in the small town of Grozdisk. His brother Mariusz (Piotr Rojuchi) has followed him into the ‘hools’, the hard-line members who support the ardent ‘ultras’: themselves separated from the ‘picnic’, family supporters. Czarni are going through hard times. The film opens with a lost match and then a running street confrontation with both opposing ultras and the riot police. Here were see the parallels with British fans, the battles, the violence and the excitement. As Oskar himself says, it is all about adrenaline. Oskar’s father is a long-time fan; he manipulated moving his planned wedding day in order to attend a match. Oskar misses his wife’s pregnancy whilst involved in the action. Meanwhile his younger brother’s girlfriend Basia (Olga Boladz) is also an ‘ultra’. The film’s plot develops when a local industrialist recruits first Basia then Oskar to train his mercenary supporter group for his newly purchased football team. His partner and personnel manager assists him. I kept thinking that there was a murkier motivation to their actions, but if so it never transpired in the film. Oskar’s and Basia’s carpet-bagging to the new team brings serious conflicts to a head. This is both between Mariusz and Basia and between Oskar and his wife Alina (Karolina Gorczyca). What fan community is about in this film is loyalty and adherence to the code. Breaches of either result in both public shaming and personal crisis. Basia, Osacr and Mariusz with fellow-ultras. The film treats both the relationships and the fan activities with humour. There are some very funny scenes spread throughout the film. And the matches and the actions of the fans do develop genuine excitement. The plotting around the rival teams and the conflicts within the fan group are original. However, the treatment of the personal developments did at time remind me of other films. This was especially true of a sequence when Oskar attempts to placate and reunite with Alina. This is a very likeable film. And it completely eschews the disturbing undertones, which are found in the British equivalents, like Green Street or The Football Factory (2004). If the ultras loyalty to their group and their team seems juvenile the films suggests that they will, in time, grow out of this.